~Eternal Snow~: Vocaloid Spotlight: Hatsune Miku Series 6. Somehow, Seikan Hikou by all the different Vocaloid characters were the centerstage during this week's ranking, but all still doesn't compare to the original Ranka \m/ キラッ☆!! Anyway, let's head to the songs for this entry. More Miku again yes. Just 1 lovely picture of Miku found on moe.imouto. Hatsune Miku - Sekai de Ichiban Chikaku ni Iru no ni / 世界で一番近くに居るのに by SAMFree. Mp3 can be grabbed here. It might come across as a sweet slow pace song, but when I was listening to it, somehow I had this feeling of sadness coming from the song, felt somewhat like unrequited love, the feeling of wanting to be with someone special etc. Or maybe it's just me. 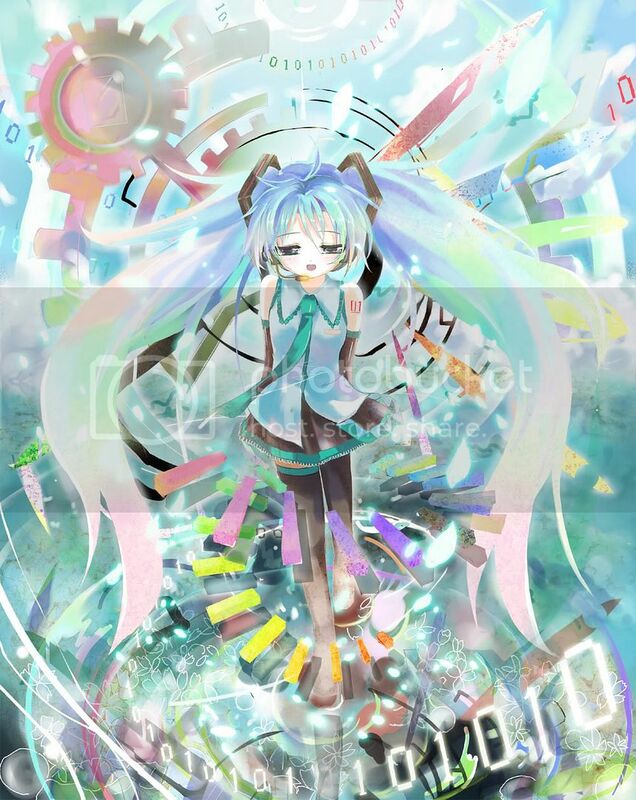 Hatsune Miku - Powder Snow also by SAMFree. Only Nicovideo available. Watching this video really brings back lots of memories when I was in Japan during Dec-Jan period last year, all the sights of the snow and scenery just comes flowing back to me while listening to the song. Thinking about it, the few post that I did of that 24 day trip didn't do it justice, and I guess I'll do some repost on it in the near future, with alot more nice photos from the whole trip. Oh yea, this is a very soothing song to listen to ^^ (I nearly forgot to comment on the song LOL). Hatsune Miku - Crying Air by natsuP. Grab the Mp3 over here. For non-PIAPRO users, grab it here instead. Nothing much to say about this song though, besides that I like the tune to it. That's it for now, as I better start to prepare my stuff for moving into my NTU hostel - Hall16 next week, and maybe get some posts up and ready for auto-post when I don't have any internet access, since I don't have my laptop yet. Hopefully hostel life wouldn't be so boring, but after all this is SG, so you'll never know. If only there's wacky stuff like those in Aussie or US, but noooo we're in SG and we're sooooo conservative. Maybe it's just me. Anyway, I'm out. P.S: Aaaaahhhhh Chun is tempting me sooo much with her photos of her Ama-loli pink-dress Moko-chan Mamachapp doll!!! I so want one tooo!! Also with the black-dressed one!! no money /cry I hate you /wrist noooooooooo. And yes I'm ranting here LOL! hey thanks for the links. There are wacky stuffs that happen here too ya know. LOL! I'm a fan. It's nice to see Vocaloid art I haven't seen before. It's really cool!!!!!! I so want some of these songs!!!!! Good Luck with your Hostel life!!!!!! IN THE FUTURE, AMIDST THE BARREN FIELDS OF WAR, WHEN BURNING ASHES FILL THE SKY, THERE IS ONLY \m/. Thank you all for the good wishes ^^. I hoping hostel life will be real fun, maybe with more stuff I could blog about to make this blog even more interesting.